FIST National Congress participants gather for group photo, May 16. 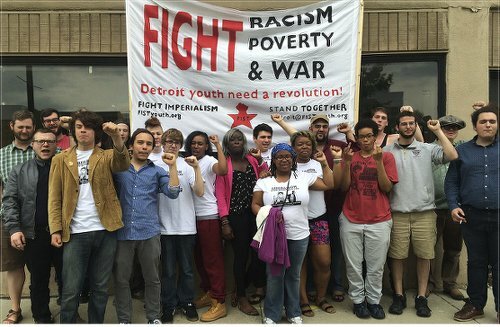 Young revolutionary activists from across the United States met in Detroit May 15-16 for the Fight Imperialism, Stand Together (FIST) 2015 National Congress. Attendees addressed the issues of racism and imperialism inherent in today’s global capitalist system. Along with establishing an organizational structure well-suited for tackling these issues, FIST members also initiated plans to participate in several upcoming actions. These include the People’s Tribunal on Police Terror and Structural Racism, to be held June 6 in Baltimore, working alongside the People’s Power Assemblies and the Black Lives Matter movement; contingents in the Lesbian/Gay/Bisexual/Transgender/Queer Pride marches around the country scheduled for June; and a March Against Capitalism in New York City later this summer to confront the financial institutions that relentlessly fund the prison-industrial and military-industrial complexes. Members also discussed an upcoming FIST delegation to revolutionary Cuba to learn more about women’s liberation, community organizing and socialism. In addition to the Detroit FIST activists who helped organize the Congress, FIST members from Rockford, Ill.; Chicago; Janesville, Wis.; and Milwaukee represented the Midwest. Representatives also attended from Durham, N.C.; Lexington, Ky.; Morgantown, W.Va.; Baltimore; Philadelphia; and New York City. Congress organizers selected Detroit for the event because of its financial and political situation, marked by rising poverty, inequality and racism. Water shutoffs, home foreclosures, gentrification and the dictatorship of banking institutions over public services characterize the city’s crises. Sara Benjamin, a FIST organizer based in Baltimore, drew parallels between the issues affecting Detroit and her home city. “Detroit looks a lot like Baltimore, divided among the haves and the have nots, the gentrified and the abandoned,” she said. In any urban city plagued with capitalism and structural racism, where jobs are scarce, education is inadequate, and people feel hopeless, you will also find anger and rebellion. The April 19 murder of Freddie Carlos Grey Jr. by racist police, for example, ignited a firestorm of rebellion led by youth in Baltimore. They expressed how sick and tired they are of the endless police killings of Black women and men. The uprisings in Baltimore were similar to those led by youth in Ferguson, Mo., who took to the streets for weeks after Michael Brown, an unarmed Black 18-year-old, was shot and killed by police. In these situations, courageous young people faced arrests, tear gas and police harassment. They also faced similar forms of class warfare like water shutoffs, lack of health care and homelessness. These struggles have inspired many to join the fight against oppression. FIST organizers, recognizing the urgent need for a mass youth movement to fight all forms of oppression, invite all revolutionary and socialist youth to consider membership. For more information, visit fightimperialism.org. Scott Williams contributed to this article.